Putting Off Your Mammogram? Here are the top myths about mammography debunked. 1. Myth: A mammogram can cause cancer to spread. Truth: There is no data to support that a mammogram can cause cancer to spread. A mammogram does use a very small amount of radiation, and is well within the safe and legal levels. The compression of breast tissue is also not a known contributing factor in the spread or cause of breast cancer. 2. Myth: You don’t have any symptoms of breast cancer and it doesn’t run in your family, so you don’t need to get an annual mammogram. Jill Steinkeler, director of breast imaging for Lowell General Hospital, agrees that the occurrence rate of breast cancer is two to three times higher for women in their 40s than it is for women in their 30s. It has been shown that nearly 75% of women who receive a breast cancer diagnosis had no family history, so it is important to get screened regardless. 3. 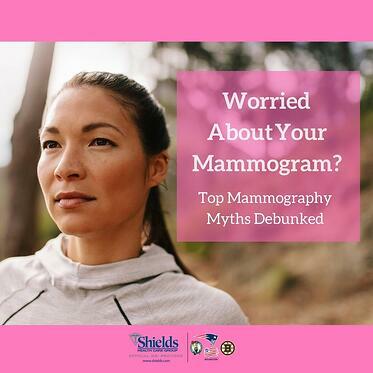 Myth: You don’t need a 3D mammogram because you already had an annual screening. Truth: A 3D mammogram is an excellent screening tool for detecting cancer in younger women, or women with very dense breast tissue. Unlike traditional mammography, which takes pictures of the entire breast in one exposure, 3D mammography takes pictures from multiple angles and uses computer processing to build those pictures into a 3D image, similar to a movie. This helps detect lumps that are otherwise hidden by overlapping breast tissue. This clarity in images greatly increases chances for early detection of breast cancer. 4. Myth: It’s going to take all day. Truth: For a routine mammogram, most women can expect to be in and out of a facility within 30 minutes. That’s not much time when you will be able to have the peace of mind that you have done your part to ensure your current and future breast health! Looking to book your mammogram today? Shields Health Care Group has partnered with Lowell General Hospital to provide the highest-quality care and expertise in breast imaging. Book an appointment today by calling 978.937.6023, or visit lowellgeneral.org/procedures/mammography.